Official attendance at the Hawaii Bowl was 29,106. Caller: I’d like to buy 100 tickets to the game, please. What time does it start? Bowl official: 100 tickets? What time would you like it to start? Folks in Hawaii must have had lots of last-minute Christmas shopping to do Tuesday afternoon or some other pressing matters, because what they clearly didn’t want to do was attend the Hawaii Bowl between Oregon State and Boise State. 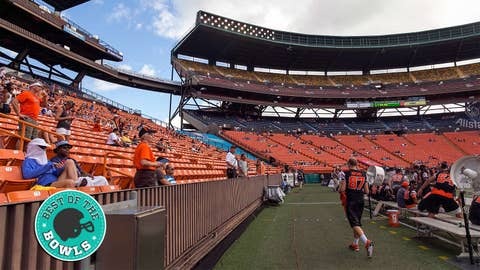 Officially, attendance was 29,106, but the vast swaths of empty seats at 50,000-capacity Aloha Stadium in Honolulu didn’t go unnoticed on Twitter. Crowd noise will not be a factor in the Hawaii Bowl game. With Oregon State solidly in control on its way to a 38-23 victory, the fans apparently began to find ways to entertain themselves. The crowd at the Hawaii Bowl tossing a football from section to section is awesome. Great way to pass the time during a blowout, I guess. Bowl organizers can only hope that the University of Hawaii returns to the game. The last time UH was in it, 2010, the Hawaii Bowl drew about 43,000.